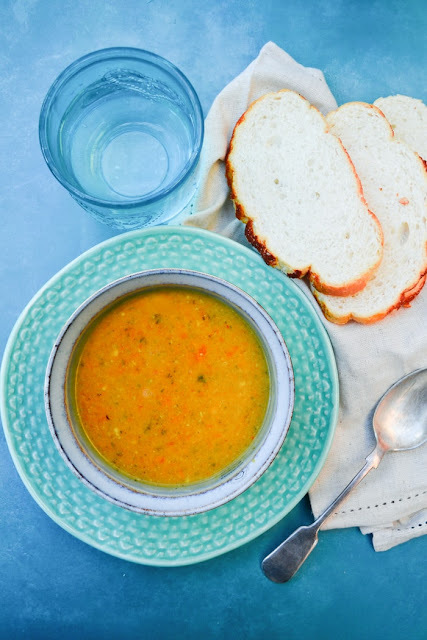 An easy carrot and mixed vegetable soup to use up leftover vegetables in your fridge or frozen mixed vegetables. Perfect for lunch or dinner. I'm making a big pot of soup every week. It's still cold here in Scotland and although we're enjoying crisp, bright days, the sun rises late and sinks again before we get home at night. It's definitely soup season. Today I bring you a flavourful carrot and mixed vegetable soup. I was initially going to make a carrot and coriander soup, but I spotted a bag of mixed vegetables in the fridge, I'd bought them to serve with a late night dinner, but ended up not using them. I decided that cauliflower cheese was enough as a side that night. 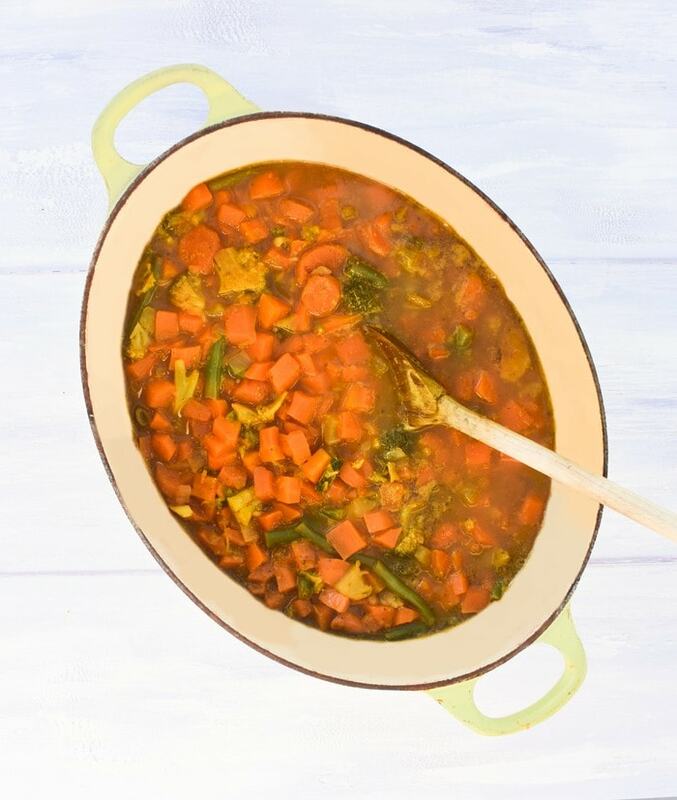 The mixed vegetable pack I added to this soup was one of those chilled packs you throw in the microwave for 2 or 3 minutes to cook. I rarely buy these packs but they are handy when you get home late at night or you don't want to buy a big selection of vegetables for just two or three of you. My pack of vegetables included carrots, cauliflower, broccoli and fine beans, but any vegetables could be added. 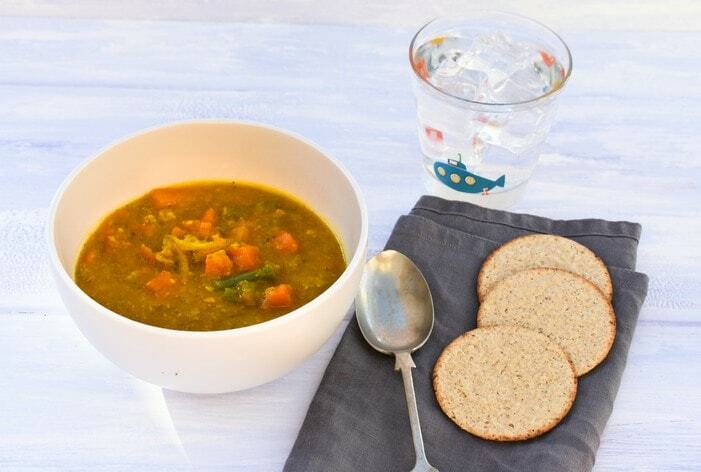 Parsnips, potatoes, sweet potatoes, leeks, spinach, kale or squash would all work well in this soup. Start with a bag of carrots as your main vegetable, then have a look in your fridge and freezer to see what you can add. I used a chilled pack of mixed veg in this soup, but you could use frozen vegetables. Whether you have packs of mixed veg in the freezer or a few bags of individual vegetables, just add some for extra flavour, texture and nutrients. When should I use frozen vegetables? Frozen vegetables are more nutritious than chilled chopped vegetables, which often have travelled far and sat on shelves for a while. The frozen vegetables are frozen quickly after they are picked and don't lose as many of their nutrients. The texture of frozen vegetables do suffer once they are cooked. They can be a bit softer and lose their crispness. I would use frozen vegetables in soups, curries and stews and keep fresh vegetables for salads and serving as a side. I like to add either lots of fresh herbs or a generous amount of spices to soups and sometimes I add both. I wanted to add a warmth to this soup so I added garlic, fresh ginger, ground turmeric, ground cumin and ground coriander (cilantto). I seasoned the soup with salt and pepper. If you would rather have lots of fresh herbs in this soup, I would encourage you to still add the fresh garlic and ginger, then add lots of fresh coriander at the end. You will still want to season it with salt and pepper. This soup was cooked in a casserole pot on the cooker top, but it could also be cooked in the slow cooker. If you are cooking it in the slow cooker you will need to add less stock. The rule of thumb with a slow cooker soup is to use a third less liquid. I would cook it for 3 hours on high or 6 hours on low, but do check it near the end of cooking time. You can either dump all the ingredients in or saute the onion, celery, garlic and ginger in a little oil until soft before adding the other ingredients. Some slow cookers have a saute function or you just saute them in a pan. I tend to use the chuck it all in method with my slow cooker. Check out my easy vegetarian and vegan slow cooker recipes page for more slow cooker ideas. 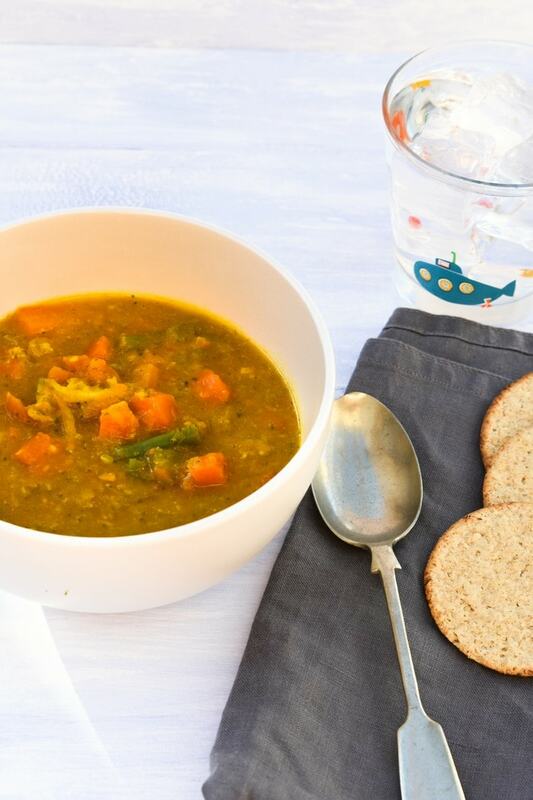 Packed full of vegetables, this tasty soup is also full of lots of healthy vegetables. It is high in dietary fibre which is important in a healthy diet to keep your digestive system working smoothly. It is also low fat and contains a good source of potassium, iron, protein and some calcium. 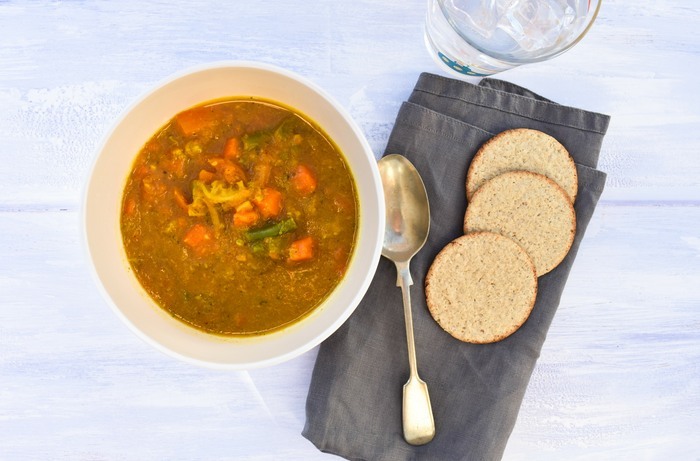 There are only 161 calories in 6 very large portions of this soup or a mere 120 calories in 8 standard portions, so it's perfect for the 5:2 diet or other calorie controlled diets. The 5:2 diet is a diet invented by Dr Michael Mosley, where you eat normally 5 days a week and eat reduced calories 2 days a week. The reduced calorie days have been proved by scientists to be a good way of fighting of some of the major diseases as the body repairs cells when eating slows down, instead of creating more good and bad cells. You can read more about the original 5:2 diet and the new 5:2 diet which was updated in 2017 and allows more calories on fast days but a slightly different structure. 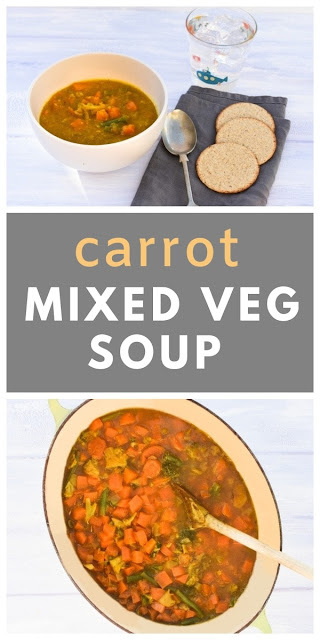 An easy carrot and mixed vegetable soup to use up leftover vegetables in your fridge or frozen mixed vegetables as well as carrots. In a large pot saute the onion, celery, garlic and fresh ginger in the olive oil until soft. Add the rest of the vegetables and cook gently for a few minutes before adding the stock. Cook at a gentle simmer for 30 minutes until the vegetables are soft and the flavours have combined and developed. Mash some of the vegetables with a potato masher or an electric hand blender. Leave lets of vegetables for texture. I mash some, just to thicken the soup. Calories are for 6 large portions. 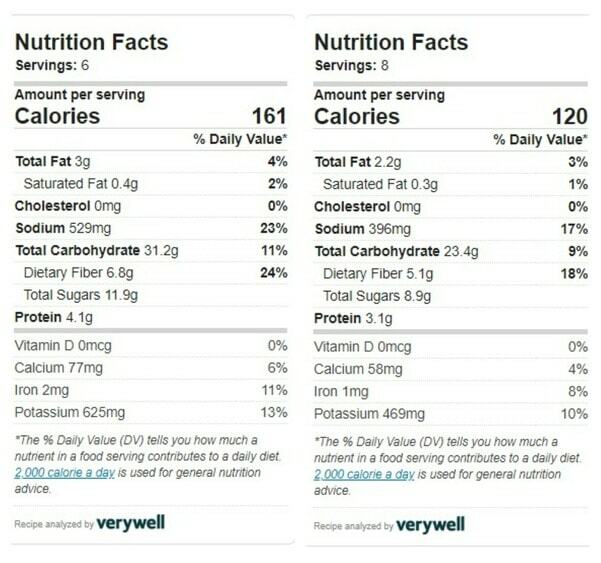 There are 120 calories in 8 standard portions. A luxurious winter soup warmed with spices and finished off with coconut milk. Luxurious but low calorie. Only 171 calories per bowl (6 portions) or 128 calories per bowl (8 portions). Love this recipe! Highly recommend. Thanks Noelle, you really can't beat a big pot of homemade soup. I was craving soup and stumbled upon this recipe. Man, was it delicious! I am so glad you tried it and enjoyed it Jessica. Yes me too and the perfect time of year for it. A great way of getting lots of nutrients too. It's been raining all day here in LA, AND I have a sore throat. I think your soup is exactly what I'm craving, and what the dr. ordered. 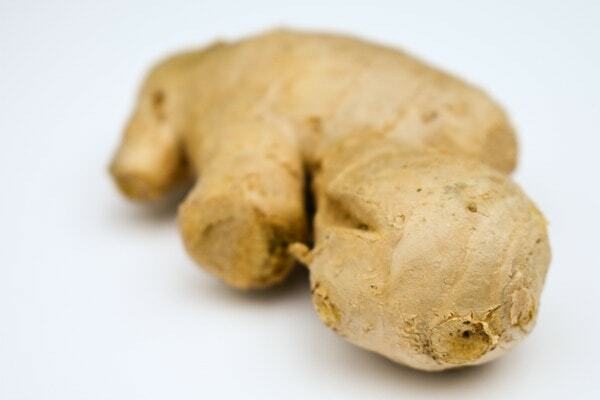 Seriously, it looks delicious and that ginger is calling to me. Oh no! I hope you feel better soon Valentina. A bowl of soup will definitely help. Yum! I'm always looking for tasty, healthy recipes! It's definitely both of those things Rebecca. You can't beat homemade soup.